Before I dig into this past weekend's races i wanted to clarify a mistake I made in my last blog post. I had a reader let me know that I was incorrect when I said that Tyler Hamilton's first race back since the '07 Tour of GA was not the Denver City Park Criterium a few weeks ago (Tyler was 2nd). Tyler's first race after the Tour of GA was the US Pro Championships in Greenville where he placed 5th behind Bobby Julich. Tyler also competed in the road champ's too last year. The threat of snow always makes early season racing in Colorado a bit stressful. Saturday had a 30% chance of snow predicted and a 100% chance of strong winds. 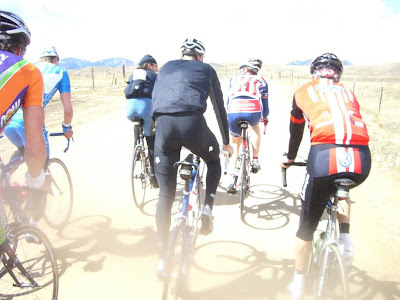 A hearty 60+ guys showed up for the Pro 1-3 event in Greeley even though the weather was better for football than for cycling. I have to hand it to the UNC cycling team as they put on a great race. Good job guys and thanks for organizing that. This 75-minute event kicked off with about Colorado's best riders including about 10 local pros. Henk Vogels went on to win by attacked the 7-man breakaway on the final lap. 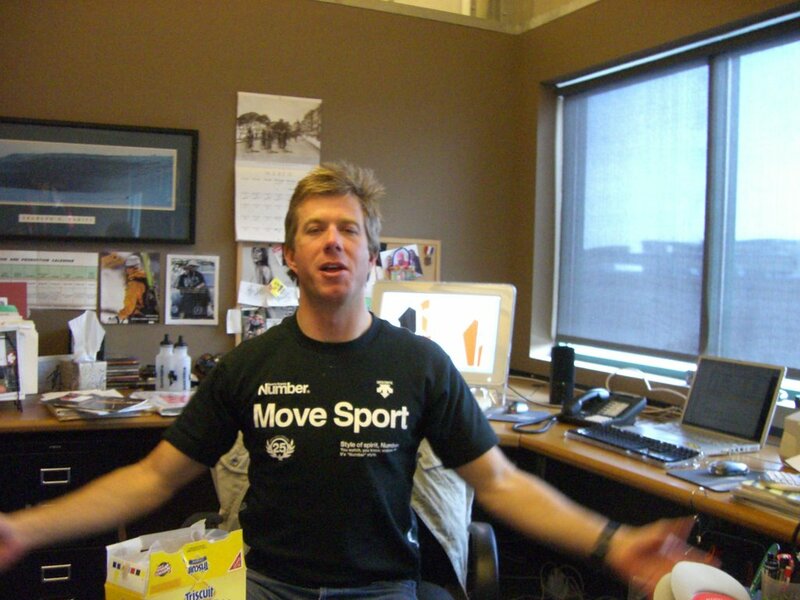 Local 40+ year old rider Jim Mohan placed 3rd and may be having his best spring campaign in 20 years. I placed 8th after having missed out on the early move, but made the most of the situation. My power data showed just how hard the race was with a normalized power of 350w for 70 minutes. Feel free to view my file here. Pull down the menu in the top right of the file and download it for additional analysis in TrainingPeaks WKO+. If you need WKO+, get a free trial of WKO+ here. I skipped yesterday's CU criterium for Easter festivities, but heard there was yet again a large pro contingent that showed up. I guess a 5 or six man move took off with about four Toyota-United riders. I heard that Tom Danielson and Tom Zirble chased late in the race but could not quit close the gap to the leaders. Up next is the infamous Koppenberg Road Race. Yet another local, yet National Calendar Quality event. Above is a picture taken from the Koppenberg course during a training ride. Trivia Time: What was Tyler Hamilton's First Race Back Since Tour of GA, 2007? Bonus Question- What place did he get? Answers at the end of this post..
Saturday March 8th: Yesterday was my first competition of the year, and if you can believe it, I am not sure what place I got more than 30 hours after my finish. I raced the Metro State Bear Creek 9-mile Time Trial and results have not been posted on the web yet and unfortunately I didn't stick around to see the results either. I think I must have been around third place just by knowing my time (~19:18) and the winner's time (Stephano Barberi ~ 18:50). Justin England of Toyota told me he was 2nd with a time just under 19'. I've also heard talk that most guys were in the high 19-minute range. So I remain hopeful that I made my first podium placing of the year. Ok so send me your feedback on my position...Too stretched out? Back not flat enough? What do you think? HR- Not accurate..Too cold and windy. Overall this data was exactly what I expected. I estimated I could hold 350w for one hour and I was able to hold 360 for 19 minutes. I do know I could have gone faster by about 10-15 seconds by just getting more training time on the bike. 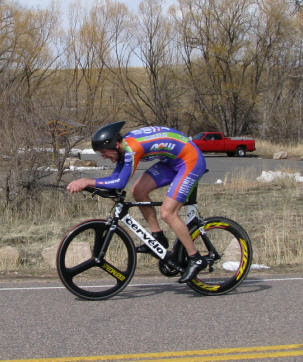 I only rode this bike three times prior to the race and never did any high-speed technical cornering on it. This was a VERY technical course and being comfy on the bike in cross winds and fast, sharp turns would have been a huge advantage. We had about 15 turns on the course which included several narrow 90-degree and 180 degree bends. Tyler was 2nd in today's Denver City Park Criterium. His first race back since tour of Georgia last year. Today's crit had a very solid field of riders which made things pretty darn fast (i averaged 330w) for the first Colorado crit of the year. In fact when is the last time you saw only 15 of 50+ starters finish in a pro 1-2 crit? There were four Toyota pros, a Jelly Belly rider, Tyler and Team THF ex-pros Pete Lopinto and Stephano Barberi. I finished 5th and Pete Lopinto of Team THF won. We established an 9-man break within the first three laps of the 60-minute race. Of the nine there were three Toyota team pros, two THF riders, Tyler, Jim Mohan, Myself and Allen Krughoff. The attacks were brutal and at one point Toyota was trying to split things up with attack after attack with more than 30 minutes remaining! Things somehow stuck together and Henk Vogels put in a good move with two laps to go but was reeled back in with half a lap to go and Lopinto and Tyler were first to the final turn. Here is a link to my race file from today, which interestingly enough had the same Normalized power as my TT yesterday....MMmmmm, might be another god blog post sometime.